It would seem strange that my last post was down south at Australia Zoo, and this post has skipped all the way up to Babinda Boulders south of Cairns but just to fill in those who have not read our blog from a few years back, we did some of the Queensland coast back then. From leaving Newcastle at the end of March to arriving up here at Mena Creek on the Cassowary Coast in Queensland for work at a place called Paronella Park at the end of April, the 6 weeks were spent visiting family, re-visiting our favourite place of Stanage Bay, through to Townsville where we once again caught up with mates, then up here. The reason we came up here was for work at Paronella Park. It was a bit of a busy time so after doing a brief induction we were told we wouldn't be needed for a few more days. We took advantage of this and did a bit of exploring and travelling of the area as we knew that we probably wouldn't get much more of a chance until the end of the season. Mena Creek is about 1 1/2 hours South of Cairns. We got back on the Bruce Highway and drove to a place called Babinda. Nearby is Mt Bartle Frere, Queensland's highest mountain at 1622m, in Wooroonooran National Park. Nestled at the foot of the mountain in lush rain forest, 6 Kms from the town of Babinda is the Babinda Boulders, also known as Devil's Pool but more on that in a moment. We had heard that Babinda Boulders was a good swimming hole, free of crocs, and as it was still April we thought we would go and check it out. There is also a free camping ground about 200m away. The beauty in this place was astounding. The boulders are granite so quite slippery, but a nice colour. The water is crystal clear, beautiful and sweet tasting. First we went on a the short and easy-moderate 2km walk down stream to Devil's Pool. There are 3 different lookouts of the boulders. On this walk the granite boulders are larger and more of them. The pools of water on this walk are off limits to swimmers. Here are the reasons. This area is one of the wettest in the country and while most places in Australia have their anual rainfall measured in millimeters (mm), places on the Cassowary Coast get so much rain it can be measured in metres instead. Bartle Frere averages over 4600mm of rain anually (4.6m)! If there is one thing I have learnt from living up here the last few months is that the rain can come and go suddenly. It may look like a downpour is about to occur, a light sprinkling may happen then it is bright and sunny a minute later. The opposite can happen too though. It can be perfectly sunny then out of nowhere the rain starts pouring down causing flash flooding in the area. On the 2 Km walk you see parts where the water rushes through forming fast flowing cascades over the boulders. When flash flooding happens in this area it would be very easy to get swept away by the water, or to get wedged between some boulders as has also happened. Nearly 20 deaths have occured in the last 50 years at Babinda Boulders, more specifically at Devil's Pool on this now off limit swimming area. After arriving back at the carpark and seeing all of the beautiful water we decided it was time for a swim at one of the designated swimming holes. The main one is near the carpark, but the second is at the start of the Goldfield walking track which is where we decided to go as there were less people. With only a few boulders here, the water was deep and didn't flow as fast, thus a beautiful safe swimming hole. Taking advantage of the beautiful sunny day and clear flowing water we decided to take the waterproof camera for a splash too. After this we decided to have a picnic lunch, at one of the many picnic tables. It is a well facilitated for there were also Bar-B-Ques, a children's play equipment, plenty of shade, and of course, the all important toilet! After lunch we then drove down the road where the free camp spot is and set up for the night. There is a choice of about 10 sites. In the middle is the toilets. They did have a shower in there also, however as it was cold I did not feel like one. I flet clean after the wonderful swim. We also came back a few nights later and spent a second night. Now for the Aboriginal stories that were on the signs. They were about Devil's Pool and the alleged curse, but behind most legends is a moral. The story about Devil's Pool is that a lady named Oolana had been promised to, and married the elder Waroonoo. During celebrations, another tribe walked by and were invited to join in the celebrations. There was a man called Dyga whom Oolana fancied and the two of them ran away together. The next morning both groups realised Oolana and Dyga were gone so went to search for them. When they were found Oolana didn't want to go back with Waroonoo and so jumped into the still water of Babinda Boulders to escape calling to Dyga as she went. Dyga followed, but the water suddenly went from still to raging caused by the pain Oolana felt. She still guards the waters today. Aboriginal stories are often told at a basic level so that the children can understand them, similar to our own culture with nursery rhymes. To those reading and looking into Aboriginal stories sometimes called dreamtime stories, ones that are visible for the public often are viewed as silly and superstitious. But you are only getting part of the story, the part that matters so you can learn the morals or lessons behind them. The elders of Aboriginal groups across Australia know the stories in much more detail. Unlike our society we are taught to ask questions, and demand answers, but their culture is that when you are ready to learn you will be taught what you need to know for the next stage, until you can once again prove yourself to progress to the next level of learning. Unless you are part of a specific group of people, interacting with them, being a part of them. The things to be learnt from this story is not to cheat on your lover as there are consequences, and the second is not to swim where the water rages. Go up stream where it is quieter. On a more positive finish, and seeing I was talking about one of the wettest regions in Australia, let me take a moment to mention Splashin' Joey Kangaroo one of the Li'l Aussie Monsters I talked about in the last post. Splashin' Joey Kangaroo was inspired by a child jumping through some puddles in gumboots on a very wet day. This child was having an amazing time jumping through the puddles and the joy was evident on his face. So if you know someone who brings a smile to your face on a rainy day, Splashin' Joey Kangaroo is the perfect companion for them. T-shirts available in children, women and men's sizing. 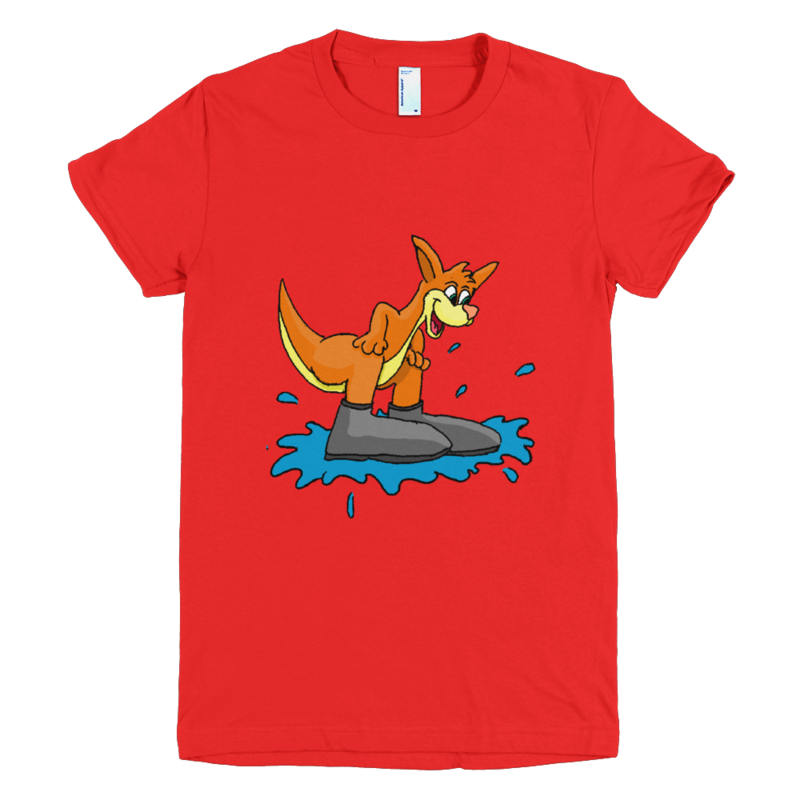 Splashin' Joey Kangaroo is available in red or blue. So it has been a while since either Cam or myself has posted anything, but 2015 has been far from boring! One of the joys of living in Australia, particularly visiting amazing places is the lack of reception to be able to write about the awesome things that we get up to. Not a bad thing really in today's internet obsessed society, it just means that like today while I have a day off, and I'm in a place where reception is available I can update the blog from happenings on the last few months. So just a warning that I may post a few blog updates in the coming weeks (hopefully)! The first blog is to be about visiting the Australia Zoo all the way back in April. After spending the weeks leading up to Easter visiting relos in NSW and the Gold Coast, it was time for us to continue our voyage North, but not before making use of a voucher we were given to visit Australia Zoo. The one that the former famous 'Croc Hunter' Steve Irwin's family owns. CRIKEY! Ironically I think I saw more African animals than Australian animals but my favourtie thing to watch was the otter show. The otters were both female, a younger and an older one. The older one had cataracts on her eyes and while the younger was more playful, she still took care of the older one. It was very sweet to watch them later on when the feeding show was not on. During the day we spent it wandering the paths and seeing the huge variety of exhibits and attractions. Of course the croc show was one of the highlights of the day. It was scary to see how close the trainers get to the prehistoric creatures! But this leads me to talk about something more recent. During our travels, adventures and tour guiding jobs we are always intrigued by the variety of Aussie animals real, and made up; ones that us Aussies make up spending many hours convincing foreign tourists that they actually exist including drop bears, bunyips, hoop snakes etc. Cameron has been inspired to create some aussie creature cartoons based on real and mythical aussie creatures and the adventures we have. The brand of characters is called Li'l Aussie Monsters. There are now 7 characters in the Li'l Aussie Monsters range each with their own story, a bit about the character and how they came about. 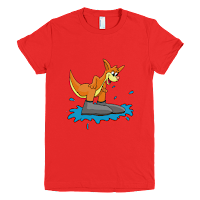 The characters are: Bubba Bunyip, Charlie Chocodile, Daryl Dingo, Gary 'the gaming' Goanna, Johnny Jump Bear, Peggy Penguin, and the latest released this week is Splashin' Joey Kangaroo. The sizing of the shirts are available from 2 to adult.